The journey from the royal city of Hradec Králové to Vrchlabí is an exciting combination of untouched nature and shining examples of Czech history. 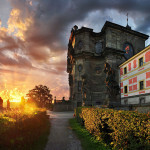 Without a doubt, a major highlight along the Elberadweg is the Baroque Kuks with its former spa baths, castle and hospital with Trinity Church and original apothecary as well as sculptures of the virtues and vices by M. B. Braun. The official signposts for the Elberadweg end in Vrchlabí. However, the Elbe’s source, set 1386 metres up in the Krkonoše Mountains, can easily be reached by chair lift or by bike bus. You can then simply roll back down to Vrchlabí. The quaint little town of Vrchlabí is the door to the Krkonoše Mountains. You shouldn’t miss the zoo in Dvůr Králové nad Labem. 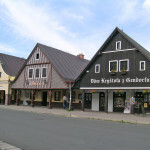 The double town of Jaroměř - Josefov - a town of parks and gardens. Špindlerův Mlýni s the best place if you plan visiting the Elbe Source in the Riesengebirge.